A Washington State Community College has graduated its first deaf commercial truck driver. Justin Brooks "became the first deaf student to graduate from Spokane Community College’s commercial driving program, and he departed on Friday to Kansas City, Missouri, where he has secured a job with a major trucking company," The Spokesman-Review reports. One of the driver instructors is quoted as saying Brooks "was a great student. He already had a great understanding of how the tractor and trailer worked in conjunction with one another, and what to look for. It made my life easy as an instructor.” Read the full story here. Some graduates of Gallaudet University have launched a company called reFort that "refurbishes departing students’ unwanted appliances and electronics over the summer and sells them to returning students by the fall," the Washington Business Journal reports. "There are a lot of customers who really don’t understand that these goods are turning into things in a landfill, and that they can actually be used again,” Myles Goldberg, one of the company founders says. Read the full WBJ story here. and more about the company from Communication Service for the Deaf here or watch their video below. Austin Freidt is a firefighter in North Carolina—with cochlear implants. "He wants other people like him in other cities and counties to be able to follow their dreams of becoming a firefighter too," WFMY-TV reports. Read more about Freidt's effort here. Aaron Heineman is suing the Utah Republican Party for failing to provide him a sign language interpreter as promised. He's being joined by Eliza McIntosh Stauffer, "who is paralyzed from the waist down and uses a wheelchair. She says the state party didn’t accommodate her during the GOP state convention in 2016," The Salt Lake Tribune reports. Read the details here. 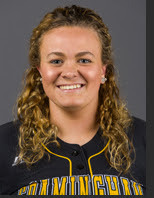 Kayla Finacchiaro is suing Newbury College, saying she was kicked off the women’s softball team because she is deaf. Finacchiaro told The Boston Globe her coach said, “You are no longer welcome here” and “The kids don’t want you on the team.” Newbury College denies she was dismissed from the team because of being deaf but the school has yet to offer another reason. Read the full story here. Liberty Gratz was working at a Virginia grocery store when she says she felt someone hit her on back. She couldn't hear the woman wanting help finding an item—so the woman hit her. WRIC-TV has a video report below. You can read more here. An online TV network for American Sign Language users called Sign1News has been in operation now for about a year. While not financied by CNN, the effort is supported by the cable news newtwork. As part of CNN Newsource, the half-dozen employees at Sign1News are able to utilize CNN video for their brief newscasts. Former Atlanta anchor Karen Graham is behind the effort. There are two regular newscasts at 10am and 7pm, Easter time. Police in Omaha, Nebraska are on the lookout for a speeding Chevy that cut off a deaf couple and then shot at their car. WOWT-TV has a video report. The Rhode Island Commission on the Deaf and Hard of Hearing plans to discontinue some of its emergency after-hours interpreter referral service for hospital emergencies starting this summer. Read the full story in the Providence Journal here. About half of adolescents with hearing loss say they have been bullied. Less than a third of other children say the same thing. That's the finding of a new student out of UT Dallas. More than one-fourth of adolescents with hearing loss indicated they felt left out of social activities, compared to only 5 percent of the general population reporting exclusion. Read more about the study here. Los Angeles police say a former TV producer is behind bars—arrested on suspicion of killing her deaf and partially blind sister. Jill Blackstone is accused of drugging her sister and putting her in their garage along with three pet dogs, which she set on fire. Read more in the LA Times here. This Friday (April 13) the film Sign Gene will begin showing at the Laemmle Theater in Los Angeles—its U.S. debut. The Pacific Standard reports, "The plot centers on an international band of deaf people, who, thanks to a genetic mutation, can channel superpowers through their use of sign language. The independent film is a fast-paced, genre-bending romp, shot on three continents with a cast made up entirely of deaf actors and CODAs." Read the full Pacific Standard article here. The trailer for the film is below. "Deaf President Now stands as a watershed moment in the history not just of Deaf and disability rights, but also of American civil rights more broadly. As I spoke to people who had been instrumental in the protests, and the current president of Gallaudet, I heard one additional message: a fear that too few Americans even remember this story," writes University of Minnesota history professor David Perry. He has put together a "A brief history of the movement that transformed a university and helped catalyze the Americans With Disabilities Act." You can read the entire article here. John Krasinksi not only directed the new film A Quiet Place, he fought to cast deaf actress Millicent Simmonds as his onscreen daughter, according to the screen writers. Screenwriter Scott Beck told the Hollywood Reporter, “We always had a deaf character in the script, but John really pushed for them to hire Millicent. She came to set and taught everyone sign language. It was really amazing and brought an extra depth to the film." Read the full story here. A deaf man in Florida has filed a lawsuit against the state legislature because it doesn’t provide closed captioning for its online live streaming and also its archived videos. Eddie Sierra is getting support from the National Association Of The Deaf. Lawmakers haven't even bothered to respond to his letters and other attempts to bring their attention to the problem. You can read the details of the lawsuit here. 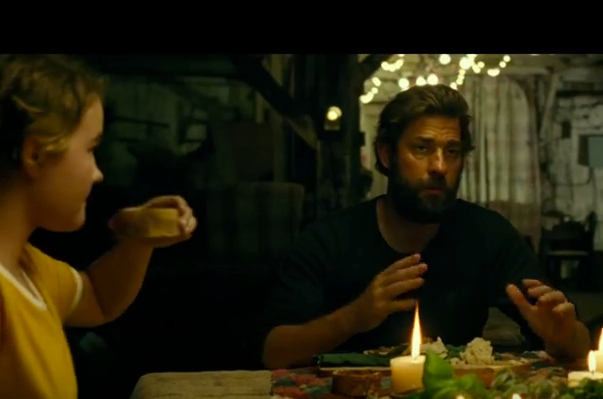 A Quiet Place hits theaters across the country today. The horror film incudes Millicent Simmonds as one of the stars. The deaf actress has already made her mark in Wonderstruck and now she plays a pivotal role in this new film about a family that must stay silent to survive. It has been three decades since students at Gallaudent University "brought the campus in the nation's capital to a standstill 30 years ago during a week-long protest to demand a 'deaf president now.'" USA Today has a look back and how it happened and a look at how students look at the movement today. 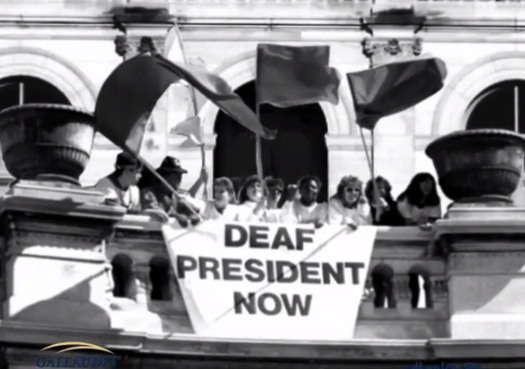 The newspaper quotes Ryan Maliszewski, who runs Gallaudet's Innovation and Entrepreneurship Institute, as saying, "Students today don't need wait for another protest like 1988 to create opportunities for leadership in the deaf community." Read the full story here.